Europe's automated space station resupply ship fell back into Earth's atmosphere overnight Tuesday, disposing of nearly 3,000 pounds waste from the orbiting outpost over the Pacific Ocean. The Automated Transfer Vehicle, nicknamed Edoardo Amaldi after a pioneering Italian physicist, plunged into the atmosphere after two rocket burns slowed the craft's velocity enough to fall from orbit. Debris from the ATV fell into a predefined zone in the Pacific Ocean between New Zealand and Chile at about 0130 GMT Wednesday (9:30 p.m. EDT Tuesday). A data recorder strapped inside the ATV's pressurized module measured the conditions of the re-entry as the spacecraft crumbled and fragmented in the upper atmosphere. William Ailor, the device's principal investigator from the Aerospace Corp., said the re-entry breakup recorder logged data and transmitted the information back to scientists through the Iridium satellite phone network. According to Ailor, information from the recorder could lead to more accurate predictions of how satellites will break apart during re-entry, yielding better threat assessments for spacecraft falling from orbit. Up to 40 percent of a satellite's dry mass can survive the heat of re-entry and reach Earth's surface. The device, which can measure acceleration, attitude, temperatures and pressures, could be a template for a black box data recorder on piloted commercial spaceships. Ailor and his team flew recorders on two Japanese resupply ships, including on a Sept. 14 re-entry. The second ATV mission carried a re-entry recorder in 2011, but it did not return any data. Ailor said an explosion during the ATV's re-entry may have damaged the instrument. The Edoardo Amaldi spacecraft launched March 23 on an Ariane 5 rocket. Five days later, it docked with the space station, delivering more than 4,800 pounds of fresh food, clothing, crew personal items, experiments and spare parts. The ATV replenished the station's tanks with about 75 gallons of potable water and transferred 220 pounds of oxygen and air. The mission refueled the space station's propulsion system with more than 1,800 pounds of propellant. 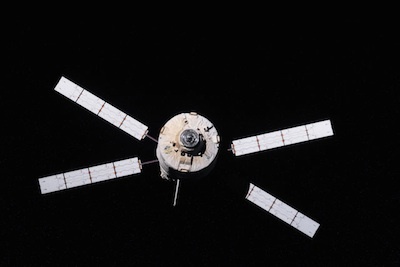 Nine reboosts of the space station's orbit with the ATV's thrusters raised the lab's average altitude by about 16 miles, according to the European Space Agency. Astronauts packed the ship's pressurized module with 2,171 pounds of trash, and the freighter's tanks held 771 pounds of urine for disposal, according to ESA. The ATV departed the space station Friday. Edoardo Amaldi was the third of five ATVs developed in Europe. The fourth ATV, dubbed Albert Einstein, is being prepared for launch at the Guiana Space Center in South America for liftoff in April 2013. Another resupply craft, named Georges Lamaitre, is being assembled at an EADS Astrium facility in Bremen, Germany, for its launch in April 2014. ESA developed the large cargo freighter to pay for the agency's share of the space station's common operating costs.